Home / Unlabelled / NUASS to Honour Fides Abuchi Onwumelu With Media Excellence Award. NUASS to Honour Fides Abuchi Onwumelu With Media Excellence Award. ....Including Gov. Obiano, Wife, Others. The National Union of Anambra State Students (NUASS) will on Saturday, 11 August, at Dr. Alex Ekwueme Square, Awka, honour Fides reporter, Abuchi Onwumelu, with Media Excellence Award. The award which is for his immense contribution to development journalism and information dissemination, will be part of activities marking the union's 2-Day "Mother of All Cultural Fiesta". Addressing journalists in Awka, the national president of NUASS, Comrade Echegwo Godwin, flanked by the chairman of Local Organizing Committee (LOC), Comrade Ezeilo Franklin, said NUASS was an umbrella body which covered all the indigenous students of Anambra State across the federation, noting that NUASS was found in all the states across the federation, adding that the body used universities as its stronghold. He said the role of the NUASS was to fight for the welfare of the students of Anambra State extraction and also to promote hard work, academic excellence, discipline, among others. Echegwo stated that the body created a forum for seminars, workshops and entrepreneurial training, noting that it was aimed at creating a forum for completeness among the students, as well as preparing them adequately for the task ahead. Speaking on NUASS's first ever cultural fiesta in Awka, Comrade Echegwo said over ten thousand Anambra State students from all the states across the federation would attend, announcing that the event would be chaired by the Commissioner for Youth, Empowerment and Creative Economy, Hon. Bonaventure Enemali. 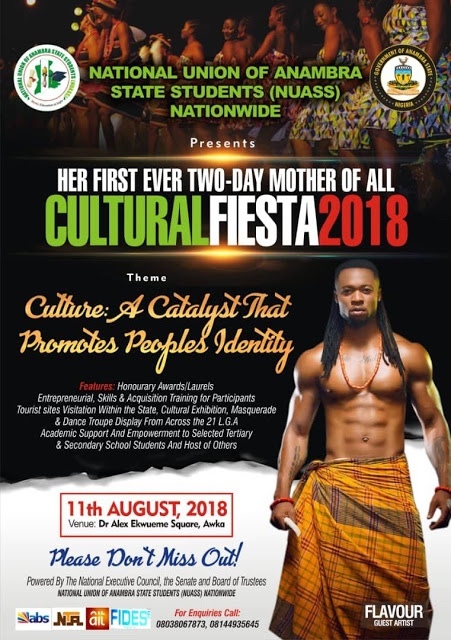 The cultural fiesta according to him, would witness several cultural displays, masquerade exhibition, talks and award presentation to several dignitaries in Anambra who had contributed greatly to the welfare of the students. He said the NUASS national leadership would on that day also honour Governor Willie Obiano of Anambra State with the NUASS Grand Service Star Award for his outstanding performance and leadership qualities, while the wife would receive Best Humanitarian Personality of the Year 2017/2018 award. (NUASS Ambassador of Goodwill), among others.